The Year in Review: Seven Fights That Moved the Boxing Needle in 2011—Pacquiao, Ward, More! By Paul Jones: In this review, I highlight seven of the most anticipated and discussed bouts of 2011. For the sake of brevity, I focus on matches with title and Pound-4-Pound (P-4-P) implications, paying special attention to fights that produced sustained action. Nonito Donaire vs. Fernando Montiel (February 19; Think Fast! ; Las Vegas, NV): In early 2011,Nonito Donaire (27-1, 18 KOs) and Fernando Montiel (46-4-2, 36 KOs) crossed paths in an epic battle to determine bantamweight supremacy. Montiel—having won 5 of his last 6 bouts coming in to the match—maintained an experience advantage at the weight class over Donaire, though the “Filipino Flash” boasted a rare blend of speed and power. The opening stanza featured a strategic exchange between the fighters, as “Cochulito” looked to probe with his jab, while Donaire seemed eager to gain the respect of his adversary by landing punishing power shots. In the second round, things would quickly unravel for Montiel. Early in the round, Donaire landed a right hand that stunned Montiel. Shortly thereafter, Donaire uncorked a picture-perfect ‘check hook’ to Montiel’s temple that short-circuited the Mexican tactician and deposited him on the seat of his pants. The brutal knockdown—my nominee for One-Punch Knockdown of the Year—left Montiel fidgeting about the canvas in a manner reminiscent of a babality in the classic Mortal Kombat game series.1 Amazingly, Montiel made it back his feet, but to no avail. Referee Russell Mora halted the bout seconds later after Montiel absorbed two more concussive blows and could no longer continue. With the win, Donaire claimed the WBC and WBO bantamweight titles and positioned himself among the vanguard in the P-4-P debate. In addition, Sports Illustrated and ESPN.com credited the Filipino Flash with 2011’s Knockout of the Year. Andre Berto vs. Victor Ortiz (April 16th; East/West Showdown; Mashantucket, CT): In a hard-hitting battle—my candidate for Fight of the Year—explosive welterweight Andre Berto (28-1, 22 KOs) set out to defend his WBC title against light welterweight standout Victor Oritz (29-3-2, 22 KOs). The winner of the bout would be in prime position to challenge the elite at 147 lbs. From the opening bell, both fighters engaged in phone booth warfare, trading meaningful shots at a frenetic pace. Ortiz struck first, connecting with a well-timed thunderclap shot to Berto’s chops that staggered the champion. “Vicious” Vic followed suit with a six-punch combination that forced the Berto to a knee. The Floridian would recover and survive Ortiz’s onslaught to finish the round. Berto’s fortunes would change in the second round when he scored a knockdown via a counter right hand to Ortiz’s chin. The punch left Ortiz momentarily stunned and forced the Kansas native’s glove to the canvas to maintain his balance. The sixth round boasted the kind of fireworks that legendary nights are made of. With both fighters taking turns bullying their way forward, it was Berto who scored the first knockdown early in the round—an obvious candidate for Knockdown of the Year—landing a John Henry-esque overhand right that folded Ortiz like a newspaper. Ortiz quickly regained his composure and returned the favor, catching Berto with the business end of two sense-scrambling lefts with seconds left in the round. It was the latter knockdown that sealed the match for Ortiz and cemented this all-action bout as an instant classic. Alfredo Angulo vs. James Kirkland (November 5; Fists Meets Fury; Cancun, Mexico): After spending nearly two years out of the ring and splitting from long-time trainer Ann Wolfe, James Kirkland (30-1, 27 KOs) returned to boxing in 2011 under the guidance of trainer Kenny Adams. The brief partnership culminated in Kirkland’s first professional loss—an embarrassing first-round TKO defeat to Japan’s Nobuhiro Ishida (24-6-2, 9 KOs), who was considered as fodder for Kirkland on paper. Shortly thereafter, the “Mandingo Warrior” reunited with Wolfe and rebounded from the loss with two wins in stay-busy fights. Mexico’s Alfredo Angulo (20-2, 17 KOs) had become the charge of esteemed trainer Nacho Beristain and was riding a 5-fight win streak—all of which had come by stoppage. The stage was set for a classic match-up of two aggressive, pressure fighters on a collision course to determine the winner of the WBC’s Junior Middleweight Title Elimnator. If there was ever a fight that 3-D technology was made for, it was this one. Angulo and Kirkland began the opening round—ESPN.com’s 2011 Round of the Year—by peppering each other with a barrage of power shots in close quarters. Kirkland, with constant pressure and blunt force, then backed Angulo into a corner and unloaded with shots both upstairs and downstairs. After missing with a left-hand, Kirkland pulled straight back and was clipped by a counter right-hand that dropped him to the canvas 28 seconds into bout. However, the Mandingo Warrior was able to shake off the cobwebs and scramble to his feet by the count of eight. A jarring left hand from Kirkland badly wobbled Angulo, which was followed by a combination of concussive blows to Angulo’s head. The latter shots put Angulo on queer street, dropping the Mexican with a mere 13 seconds remaining. Though Angulo would beat the count, he was out-muscled and worked over the remaining rounds. Moreover, it was El Perro’s gassed state and inaccurate punching, coupled with Kirkland’s Terminator-like attack, which led to his stoppage in the sixth round. Manny Pacquiao vs. Juan Manuel Marquez (November 12; Pacquiao/ Marquez III; Las Vegas, NV): In one of the most disputed decisions of the year, perennial P-4-P entrant and WBO welterweight titlist, Manny Pacquiao (54-3-2, 38 KOs), squared off against long-time rival and WBA/WBO lightweight champion, Juan Manual Marquez (53-6-1, 39 KOs). 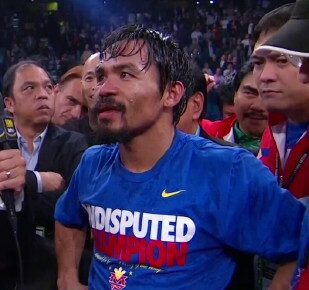 The match was the final chapter in their trilogy, with “Pac-Man” owning the advantage after a (disputed) draw and split decision win over Marquez in their prequel and sequel. The bouts opening rounds were difficult to score with Pacquiao trying to establish his jab and deliver lightning-fast combinations to his foe, while Marquez was intent on working Pacquiao’s midsection and capitalizing on the Philippino’s mistakes with crisp counters. Though nip-and-tuck, the middle rounds belonged to Marquez who connected with Pacquiao’s head and body with increasing regularity. Despite his age, “Dinamita” controlled much of exchanges on the inside and even befuddled Pacquiao with his speed. The final rounds were replete with action as Pacquiao continued to dart in and unleash heavy blows to Marquez’s head. However, the tough-as-nails Mexican held his ground and responded to most of these advances with effective counter-punching. As the final bell sounded, Marquez raised his hands in triumph, while Pacquiao slumped his head in ostensible defeat. The scorecards, however, told a different story as Pac-Man was awarded a majority decision over Marquez. Despite Dinamita’s advantage in punching accuracy, it appeared that the judges were more persuaded by Pacquiao’s power-punching efficiency and volume. Though many in the MGM Grand believed that Marquez did enough to earn the victory, Pacquiao retained his title and status as Ring Magazine’s #1P-4-P fighter, nonetheless. Miguel Angel Cotto vs. Antonio Margarito II (December 4; The Battle 2; Manhattan, New York): One of the year’s most anticipated battles featured the tactical savvy of WBA Super World Jr. Middleweight Champion, Miguel Cotto (37-2, 30 KOs) vs. the relentless pressure of his nemesis, Antonio Margaritio (38-8, 27 KOs). Amid controversy—stemming from his 2009 TKO loss to Shane Mosley (46-7-1, 39 KOs)—and one of the best HBO Face Off segments to date2, the long-awaited rematch was expected to be must-see TV. The sequel, however, failed to produce the dramatics of their initial clash. It came as no surprise that the “Tijuana Tornado” applied a heavy dose of pressure to the Boricua badass from the opening bell. Margarito’s pressure, however, was far from intelligent. Though no knockdowns occurred, Cotto’s flawless game plan (i.e., movement and consistently peppering Margarito’s damaged right eye) and punching efficiency (landing 51% of his power punches) were critical to his technical stoppage of the Tijuana native. Margarito’s lack of execution (landing a mere 22% of his total shots) and propensity for grotesque eye swelling were equally important. With the win, Cotto retained his title and placed himself in good stead for high profile fights versus the elite from welterweight to middleweight. Amir Khan vs. Lamont Peterson (December 10; Capital Showdown; Washington, DC): In one of 2011’s more compelling fights, WBA and IBF Junior Welterweight Champion Amir Khan (26-2, 18 KOs) challenged Lamont Peterson (30-1-1, 15 KOs) for bragging rights at 140 lbs. This bout did not disappoint. The opening round featured Peterson hitting the deck twice at the hands of Khan—the first ruled a slip by referee Joe Cooper, while the second was officially scored. Peterson would recover and commit to an assault on Khan’s body that kept the champ on the defensive in the early rounds. Khan reestablished himself in the middle rounds with thudding power shots and intelligent movement. However, “King” Khan would suffer a costly point deduction in the seventh round that played a pivotal role in the bouts scoring. The championship rounds were marked by sustained action that saw both fighters give as much as they took. It was a critical point deduction (for pushing) in the final round, however, that ultimately cost Khan the match. Peterson would go on to a split decision victory over Khan and claim his share of the junior welterweight crowns. Khan has since appealed the loss and appears intent on securing an immediate rematch. Andre Ward vs. Carl Froch (December 17; Super Six World Boxing Championship: The Final; Atlantic City, New Jersey): The year’s final marquee match-up featured the cerebral technician and WBA Super Middleweight Champion, Andre Ward (25-0, 13 KOs) against the über-confident and talented WBC champ, Carl Froch (28-2, 20 KOs), in the Super Six tournament finale. After more than two years, the tourney’s champion and Ring Magazine’s World Super Middleweight titlist would be determined. In the early going, Ward displayed his versatility by out boxing the “Cobra” on the inside and out. Froch, a classic boxer-puncher, appeared unable to adjust to S.O.G.’s speed, accuracy, and slick defense. The middle rounds boasted some heated exchanges in which both fighters were able to land leather on each other. Ward, however, often get the better them. The Nottingham native pressed the action in the championship rounds, while Ward relied on boxing’s version of the four corners offense—picking his spots and holding when needed—to keep his opponent at bay. Despite his increased activity, Froch simply could not overcome Ward’s laser-like precision (landing 42% of his shots) and insurmountable lead on the scorecards. Ward’s virtuoso performance served as the defining moment of his career and earned him the WBC and Ring Magazine titles. In addition, the former Olympic gold medalist was recognized as USA TODAY and ESPN.com’s 2011 Fighter of the Year. While arguments can be made regarding S.O.G.’s placement on the P-4-P list (currently ranked #5 by Ring Magazine), a mega-showdown with IBF Super Middleweight champ, Lucian Bute (30-0, 24 KOs), is among the most anticipated matches in 2012. Honorable mention: Timothy Bradley TD10 Devon Alexander; Miguel Angel Cotto TKO12 Ricardo Mayorga; Bernard Hopkins UD12 Jean Pascal (II); Wladimir Klitschko UD12 David Haye; Abner Mares UD12 Joseph Agabeko (II); Floyd Mayweather Jr. KO4 Victor Ortiz; Brandon Rios TKO3Urbano Antillon; Delvin Rodriguez UD10 Pawel Wolak (II); Orlando Salido TKO8 Juan Manuel Lopez; Pongsaklek Wonjongkam UD12 Edgar Sosa. 2 See http://www.youtube.com/watch?v=9zXxfbQ4Hpg for a review. —Questions/Comments: Contact Paul at pjonesfreelance@hotmail.com. Note. The views expressed herein are those of the author and do not reflect those of Boxingnews24.com or its affiliates. Boxing » Andre Ward » The Year in Review: Seven Fights That Moved the Boxing Needle in 2011—Pacquiao, Ward, More!